We took the kids to a local carnival and funfair yesterday, and between watching the local cheer-leading squad and being deafened by the boys clanging the bell on the train ride, I sneaked off and looked at some of the bric-a-brac stalls. All I picked up was a book for 20p, but it's a good one - Fancy Dress for Children by the marvellously named Barbara Snook. 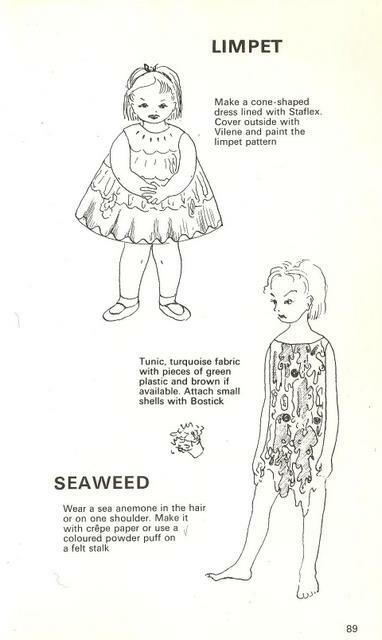 Ms Snook is full of ideas for all kinds of outfits, but the whole book is basically sketches. There's the odd pointer as to materials, but no detailed instructions. For example, the Demon King's crown is captioned 'Black with red jewels, fruit gums on fine wire'. 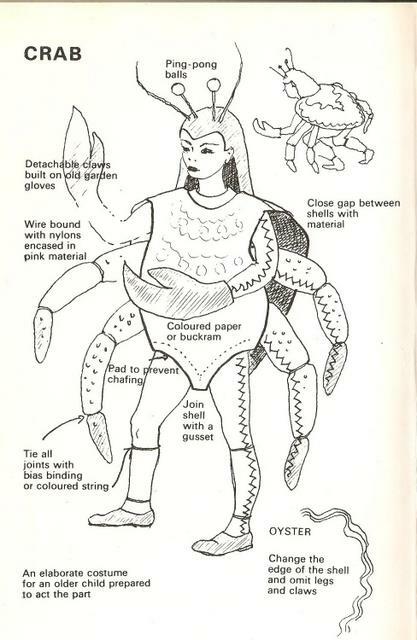 Or you could send your child off to the party dressed as a crab - only gardening gloves, tights and ping-pong balls stand between her and that first place rosette. There are lot of costumes based on slightly dubious cultural stereotypes - Sheiks, Rajahs and Gypsies abound, and basis of their apparel is apparently night attire. We are told sternly that the pyjama coat and trousers of a Mexican should NOT match, a blue coat and apricot pants are often worn together. 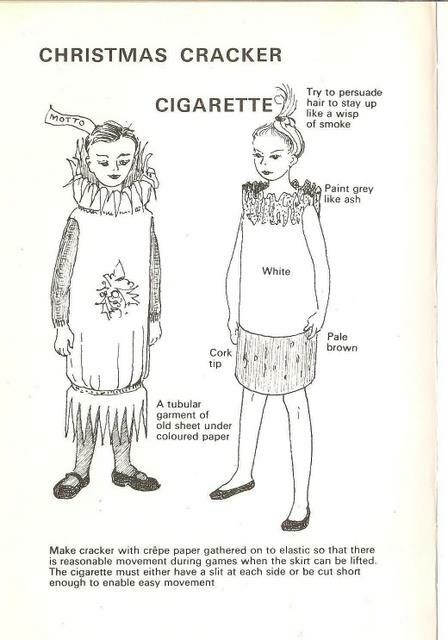 And I imagine that only in 1969 would a book suggest that a child go to a party dressed as a cigarette! Where this book excels though, is in the unexpected costume. We've all seen a toddler look adorable as a ladybird or bee, but when you get that letter home from Nursery explaining that Ruby is to be a limpet in the Nautical Nativity, where do you turn? Why, page 89 of course! Poor big sister seaweed looks rather sulky. 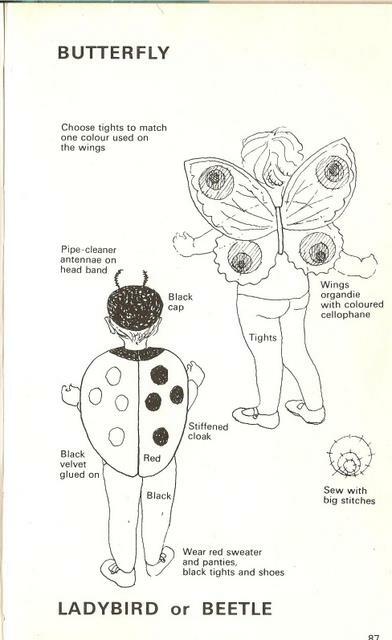 Cute as a butterfly bum is, don't forget the tights. 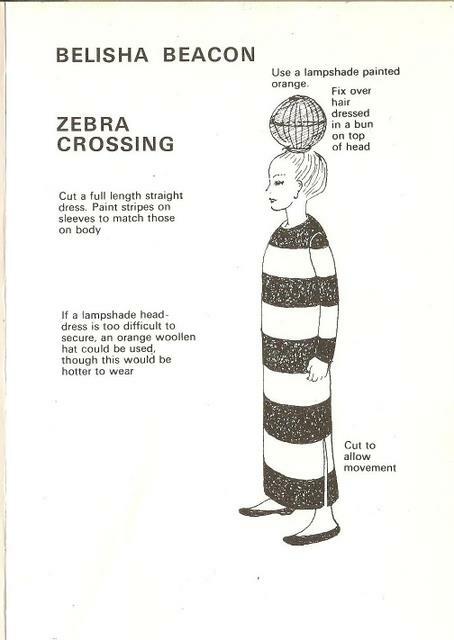 How about a Belisha Beacon* costume for a tall skinny child? Or a Saucepan, on the Boil, made from corrugated cardboard, with cotton wool spilling out from the top. 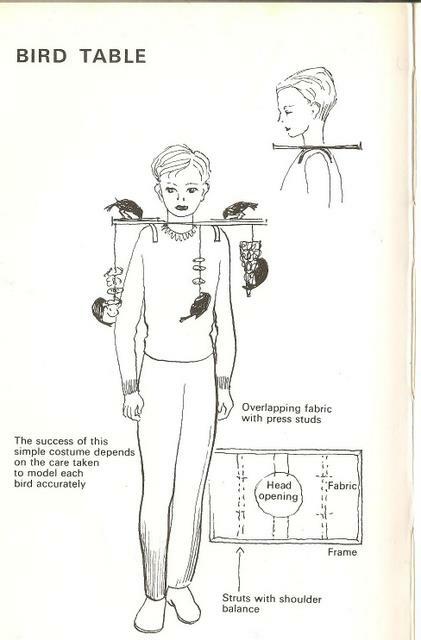 Snook helpfully suggests that 'This can be worn by a very plump child'. 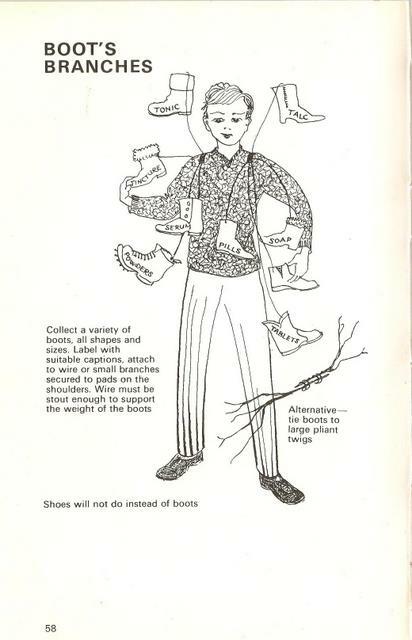 And what about the child wearing a top-hat and tails, carrying crampons and an ice-pick? Why of course! A Social Climber! 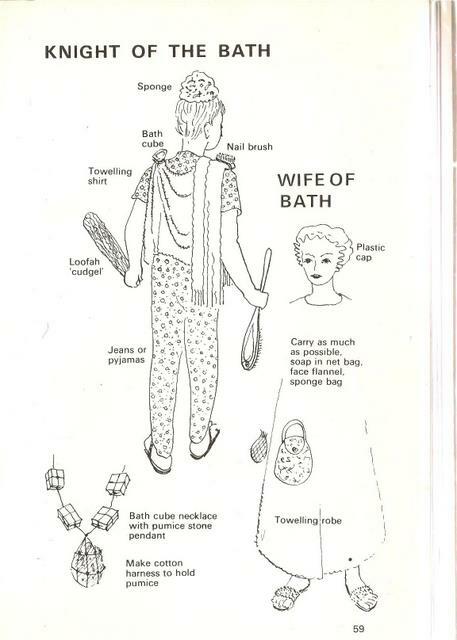 I can also just picture the 6 year old Chaucer fan begging to go as the Wife of Bath, as opposed to a Princess. Who wouldn't want a necklace of bath-salts and pumice stone? ...The Vintage Knitter! I took a screen grab of the random number generator, but couldn't figure out how to include it in this post. So you'll have to take my word for it. Congratulations! If you email me your address at charityshopqueen@gmail.com I'll get it in the post to you asap. on the cold metal before you can attach anything. As you can probably tell, I'm really taken with this idea, and will doubtless never need to buy a ring again by the end of the week. I'm thinking that a plastic apple button would make a great homage to Marc Jacobs - or alternatively cute party bag gifts for a little girl's birthday. Oh, and I made this ribbon corsage type thing as well - with an actual needle and thread! I know this idea entered my head via blogland, but no clue where - sorry if it was yours and I haven't credited you - let me know. If you haven't joined the swap yet - I'm closing it later today as I have a big spreadsheet to wrestle with! Ebay. It's a fertile source of vintage (and not so vintage) fripperies, genuine Mulberry Alexas all the way from China, and last year's Primark playsuits. If you type 'chewing gum' into the buying page, the related searches it gives you include 'used chewing gum', 'half eaten sandwich' and 'Britney Spears bra'. Yup, it's a whole compendium of crazy, but some items (and sellers) take it to a hitherto undiscovered level. So, welcome to the first in an occasional series of magic and madness I've found on Ebay. For your delectation today - Spirit Dolls! Oh yes. You thought reborn dolls were a bit freaky? Indeed they are, and I would swear this is in fact a real child - for $400 I would expect him to be, frankly - but Spirit Dolls go one better. 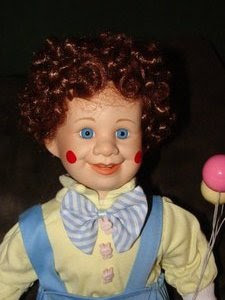 'Barry' on the left there doesn't do much (unless you count emptying your bank account - spookily realistic again) but don't you want a doll who can 'communicate with you through dreams', 'cause lights to flicker', 'slam doors' , 'create cold spots' or 'play with the faucet'? This is Madalyn. Gosh, she's just adorable isn't she? Perhaps she died at a birthday party, choking on a Chicken McNugget. 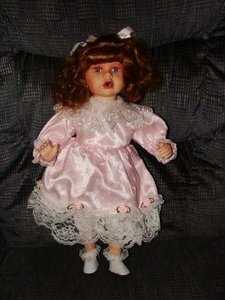 "All I ask is that you give your spirited doll a good and loving home. Treat each of them with the utmost respect. After all, you too may be a spirited doll someday"
Yes, just as the Bible tells us folks...lead a good life and end up trapped in the body of Tiny Tears, spending eternity turning a fridge on and off. Of course, you'd probably want a friend for Madalyn wouldn't you? This is Mira, who fell in the creek and drowned whilst trying to catch tadpoles. Oh goody, she can stand up. Wouldn't it be lovely to see her crossing your room at night? Whilst researching this post I very nearly clicked Buy It Now rather than Add to Watch List. Phew. I could have inadvertently purchased a 'Haunted Evil Demonic Wooden Zebra'! "About a week after bringing this into my home weird things started to happen...doors slamming when no one else was there and heavy footsteps, disembodied voices and a horrible smell at times..."
Fast ship and as described. Would do business with again! My wife says Thanks! One can only imagine the occasion that calls for a baby doll with demonic possession as the perfect gift. If your budget is a little larger than $24.99, who could fail to be enticed by this title? HAUNTED POSSESSED DEVIL DOLL FROM THE GATES OF HELL!!! 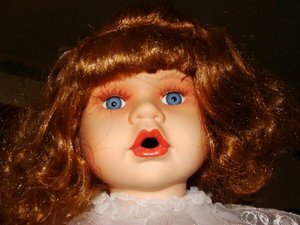 "I have seen people paint dark eyes on dolls, write ludicrous long stories, with no merit about their “haunted dolls” and even claim they have a infinite supply from a “magic Grandmother”, or some other fictional person, in an attempt to sell an otherwise plain and ordinary doll to somebody, for no other reason but personal gain." Naturally, she'd never take any of her dolls out to a cemetery and pose them on a selection of other people's graves! I mean, that would just be wrong, wouldn't it? Don't judge a tin by its, erm, lid? Hello, and welcome to my 50th post! [Yes, I know it took me a while. That's me]. It also seems like a while since I've found a decent bargain in a charity shop, and I nearly missed this not particularly attractive biscuit tin on the shelf. I'm glad I didn't though, as it was full to the brim with cookie cutters and all sorts of cake decorating paraphernalia. I seem to be developing a large collection of cookie cutters, and this tin enabled me to add to my gingerbread man army, including a teeny-weeny Mr and Mrs pair only a few centimetres high. I can also now make gingerbread pigs, should I so desire. [I do, obviously]. ﻿I think the tong-y things are for crimping icing. It makes me happy to know that if any icing ever needs crimping, I'm all set. There was also a mini heart shaped cake tin, and over twenty icing nozzles of different sizes, some of which appeared to be really old. The contents of the whole tin was £1.50, and having looked on a couple of sugarcraft websites, I've discovered that just a single icing nozzle can cost up to £2.50. There were 22 in there, plus 10 cookie cutters and all the other bits and pieces. So I'm declaring it a bargain! I'd also like to say hello to all my new followers - hurrah to reaching 200 - and thanks again to everyone who follows and especially those who comment, I really appreciate it and am amazed the blog has got this far in 4 months. I'm constantly inspired by so many of your blogs - and I've been challenged to do an outfit post. We'll see! * And I can't wait for the great charity shop swap. Finally, if you follow - you've got a great chance of winning one of my giveaways. Do enter my Plum and Ivory giveway if you're in the UK, and the Trashion Magazine competition is open worldwide. * Did I sound jauntily nonchalant there? I'm terrified. As I mentioned yesterday, the lovely people at Plum and Ivory are running a little giveaway for followers of Faith Hope and Charity Shopping. (Delivery to UK addresses only please). They have put aside 5 of these gorgeous vintage style metal hanging birds for 5 lucky readers - I have one already otherwise I'd be swiping one for myself. a gorgeous vintage touch to an Easter or Christmas tree. 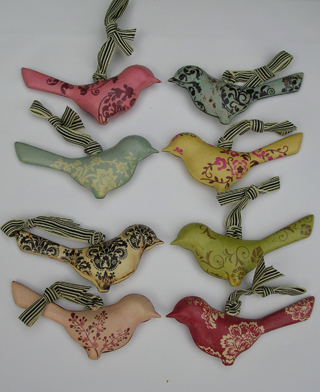 "Win one of 5 vintage style hanging bird decorations from Plum and Ivory at Faith Hope and Charity Shopping blog. http://tinyurl.com/3vbn7xr"
Please leave an additional comment if you do either of these. The draw will take place on June 10th. In addition to my marathon wander around East London last weekend I also went to the Spirit of Summer fair at London Olympia for a few hours. Whilst the ticket prices for shopping fairs like this are always on the pricey side - about £15 - I usually manage to obtain free tickets, and on this occasion was lucky enough to have been sent complimentary passes by one of my favourite online gift companies, Plum and Ivory. Spirit of Summer (and similar events like the Country Living Fair) are excellent for sourcing unusual presents, and discovering new companies and products you'd have difficulty finding on the high street. It's a great way to support smaller British businesses, and I came across all kinds of wonderful crafters, designers, and artisan food makers. These patchwork style tiles were £5 apiece, but I know some of you shabby chic and quilt lovers are drooling! They are beautifully made by Welbeck Tiles in Cornwall. They did garden birds in addition to the florals, and have many more designs on their website, but my favourites were those copied from vintage postcards. They had virtually every British seaside resort you can imagine, and I think one or two would look lovely just propped on a shelf. Some were the back of the postcard, so you see the 1/2d stamp and read the message. I enjoyed Archie's card to Mum and Dad that he was having a lovely time, and had "got all burnt up!" They will even make you tiles from your own postcards if you can't find what you're looking for. I guess my willingness to buy helped as well! I've always liked her cushions - yes, I know they're everywhere, but hey - although the hefty price tag of around £60﻿ for a small union jack design has put me off up until now. But at the fair I found this 'make your own' kit - everything you need to stitch one at home, and for the special 'show price' of £20. So, watch this space, surely even I can manage this? Lovely thrown porcelain by Linda Bloomfield. Everything is hand made and dishwasher and microwave safe. all their gorgeous materials, but the stall holder was very patient and I did buy! I have seen these kind of products before but the quality was excellent, and everything looked extremely durable. The bright colours are lovely too. I of course went to Plum and Ivory's stand to thank them for the tickets and to check out their new range of 'affordable luxury gifts'. They have something for every budget - from delectable cashmere ponchos, to hair slides and book marks made from vintage fabrics. I'm excited to say that I'll also be posting about a Plum and Ivory giveaway in the next couple of days, so keep your eyes peeled for that. I am beginning to collate all the prospective swappers details now so apologies if I haven't been commenting on your blogs as much as usual. ﻿The swap seems to have generated a lot of excitement and I will do my best to make sure that everyone gets to take part, but it will depend on numbers and of course countries of swappers involved, so please bear with me! I will try to let everyone know their swap partner by next weekend, but as the numbers are getting quite large it may be the second week in June when I return from my holiday - will keep you posted! If you'd like to take part, please ensure your blog is linked up to your profile so I can find you when you comment - and active bloggers only please. Opinions on the fair are my own. This is not a sponsored post. Faith Hope and Charity Swapping! Let's do it! I knew you'd be up for it! Any excuse to go shopping - and it's entirely guilt free. Quite a few of you have expressed an interest on my last post here, but I'm going to keep it open until the end of next week so other people can sign up too. I'll sort out the swap partners, then I reckon about 6 weeks for the hunting and gathering - what do you think? Do tell any blog friends you think would enjoy it, and if you could put the button below on your sidebar and link it back to this post, that would be great. So, this is supposed to be fun and thrifty and I don't want to give too many orders, but I was thinking at least 3 items, with a maximum of 5. Try and get a sense of what your swap partner likes from their blog posts, pictures etc - and it's not cheating to ask them questions before hand! There is no minimum spend. If you are thrifting genius who sources art deco jewellery from jumble sales for 25p, all the better! Absolute maximum spend is £12 but there is no need to spend this amount if not necessary - remember you will need to post things too. I'm sure I don't need to say this, but do give anything second hand a launder / clean up if necessary! Remember to let your partner know when you receive your parcel, and then it would be lovely if you posted about the swap so we can all share what we got. Any thoughts or suggestions? Does the money element sound right to you? I don't want to be bossy, but I don't want anyone being disappointed either! It's a parcel from the very lovely Kylie at Lucy Violet Vintage﻿ who blogs about her incredible op-shop and roadside finds in Perth, Australia. If you haven't checked out her site yet, wherever have you been? Kylie got sick of me bellyaching that there were no granny blankets to be had in my neck of the woods - at least not without paying silly money - and promptly shipped some off to me. Vintage granny blankets made by vintage Aussie Nannas - I love them! (Kylie had been a bit worried that by the time the boat came in I'd have made my own, but those of you who have seen my crochet endeavours here and here will know that was never going to be very likely). I was further spoiled this week by our resident flamingo fancier and kitsch lover Scarlett of Scarlett loves Elvis who sent me a patriotic Welsh dragon apron she pounced on for me in a charity shop - perfect for making my welshcakes. (It was also in pink paper, but I was too busy ripping it open to find a camera). I haven't got a decent photo yet so you will have to imagine its glory, but here's a pic of my new yurrhrin's (as they are inexplicably pronounced in the valleys), also from Scarlett. They're brilliant - and I have the perfect nail varnish to match. Thanks lovely! Anyway, whilst out and about in the charity shops and boot sales of South London I have also found myself spotting things I think my blogging buddies would like, and it got me thinking. I've seen swaps on other blogs - does anyone fancy Faith Hope and Charity Swapping? I haven't thought the details through fully yet - now there's a surprise - but it would probably involve letting me know you fancy it, me sorting out the swappers (I'm guessing most will be in the UK, but if you'd be up for posting internationally, or if I can find a swapper in your country, then great) and deciding on a little budget, theme and deadline. Then you check your partner's blog, find out a bit about them, and look out for second hand treasure and handmade loveliness you think they'd like. Result - everyone gets lovely parcels in the post. Anyone up for it? Let me know and I'll sort out a button and an 'official' post.